Tony Abbott has damaged himself still further with his latest and most brazen challenge to Malcolm Turnbull. The big winner will be Peter Dutton, who is rapidly becoming the right's choice as prime minister. There's now open warfare between Tony Abbott and the government in response to Abbott's latest attack on Prime Minister Malcolm Turnbull and his attempt to set out a new path (or, more accurately, the same old path) to the right for the Liberal Party. Let's skip the pro forma footnote that Abbott is an egregious hypocrite for urging a cut in spending when he dramatically increased spending as prime minister and get straight to it. This is Turnbull's response: Abbott "knows exactly what he's doing and so do his colleagues". "We are acting and we're getting things done. We're getting things done that we couldn't or wouldn't or didn't get done in the last Parliament." The Turnbull government has abandoned its signature company tax cut policy. Malcolm Turnbull this morning called on his opponents to hit him with their best shot. And Peter Dutton delivered a body blow that means his prime ministership is terminal. 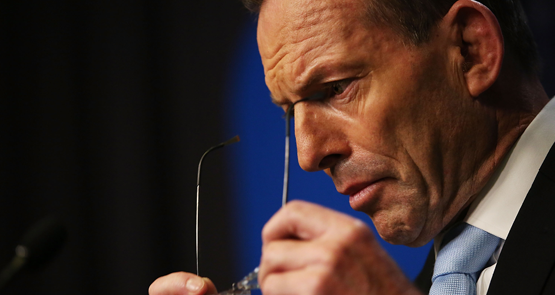 Tony Abbott was counting on a fifth column of conservatives within the Liberal Party to help him bring down Malcolm Turnbull. But the conservatives are closing ranks. Unsurprisingly, Tony Abbott will remain in politics, and his formidable fighting skills will be directed at Malcolm Turnbull. Tony Abbott, dogged by misjudgment and poor luck, had a week so bad that some of his colleagues want him gone as soon as possible.